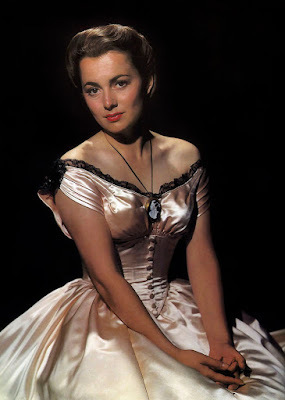 Throughout July, I celebrated the 100th birthday of Olivia de Havilland with a look at three of this old Hollywood legend's best films. The Adventures of Robin Hood (1938): This rollicking swashbuckler about medieval English outlaw Robin of Locksley and the noble Maid Marian is the best of the Errol Flynn/de Havilland films. The Snake Pit (1948): De Havilland gives a sensitive performance as a troubled young woman who spends time in an insane asylum. Hush. . . Hush, Sweet Charlotte (1964): De Havilland and her old Warner Bros. pal, Bette Davis, team up for this creepy Southern Gothic horror film. When I was eight, I used to watch THE ADVENTURES OF ROBIN HOOD, and between my frenetic slashings with my wooden sword (one of many, well-crafted by my carpenter father), I would stare dreamily at her humble and graceful smile. So pretty. The fact that she can act, like WOW, makes her a lifelong on-screen fave. Olivia is at her most beautiful in The Adventures of Robin Hood.